I began this book over a week ago and have only managed 100 pages. That’s not like me. I’m not sure if it’s my own mood through Thanksgiving or if the book is “boring”. All I know is that I am setting it aside for now and will try more of it at another time. For Now I am going to close that book and try another ..
… we’ll see if this one gets my interest better than the other. I really do dislike giving up on a book, and it happens rarely (thank goodness). And although the author doesn’t seem to have found whatever it is that makes a biography interesting as did Simon Louvish with “Stan and Ollie”, I do think my mood has a lot to do with it also. 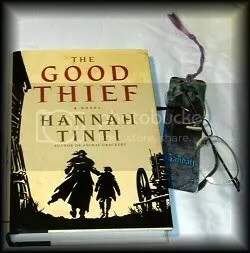 Here’s hoping The Good Thief shakes me out of the funk the other book seems to have put me in. Meanwhile I have been enjoying movies! As you saw in my last post I went to see Australia and it was enjoyed to the fullest! On the “home front” David bought some movies and we’ve been watching them too. First we watched Wall-E. I now want a toy Wall-e!! Too darn cute! hahaha.. I can relate to Wall-e never getting things to work out they way he hoped, but never giving up either! Then there was Kung Foo Panda. It was cute, but not nearly as good as Wall-E. In the wings we have Journey to the Center of the Earth with Brendan Fraser. 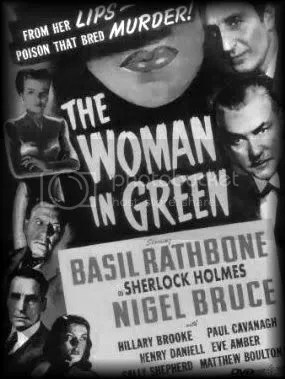 Then TCM showed two more Basil Rathbones Sherlock Holmes movies yesterday… so it’s been a good few days for movies. … that my friends is snow! Yep it snowed like hell for about 20 minutes, then slowly turned to rain. 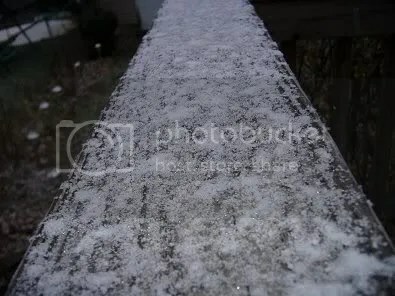 :o( But I ran out to the deck in the back and took this photo of what snowflakes managed to stick to the railing before they disappeared! Oh man!… I saw Australia today! This movie will get some nods from the motion picture academy that’s for sure! The cinematography was outstanding for this movie! Young Brandon Walters, will steal your heart! Faramir/ Lord of the Rings… better known as David Wenhem. Well, I got shocked seeing him in this movie… as one of the Bad Guys! 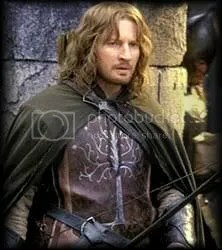 Our Faramir! A bad guy! aggggggggggggh! It’s a long movie (2 hr 45 min) but to be honest with you.. it could have even been longer and it would have been fine with me! It’s a story about doing what’s right. It’s a bit of a Western. It’s a bit of a love story. Ok.. so.. how many of you watched the Macy’s Thanksgiving day Parade?? For as long as I can remember the parade is always on the television in my house or where I am living. But, since I am generally the cook, I only see “bits ‘n’ pieces”. I can’t remember ever having seen the entire parade! This year I did catch something of interest to me though. Seeing as I am old enough to have my birth certificate carved out on stone, I found one band of particular of interest… they are called The Second Time Arounders Band. If anyone looked closely they would have noticed that most of the band members had white hair! What? 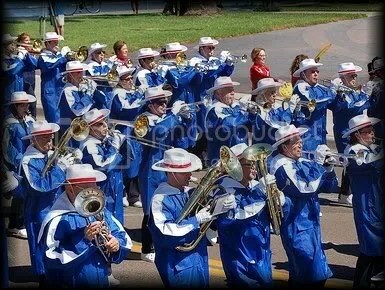 A marching band of old folks? Does this mean some old folks can actually do some things the younger folks do? For years now (since I reached old age) I wondered about some things concerning “old folks”. They don’t star them, and at times barely mention them.. yet, there they are. In the same story. Often doing the same things the younger folks are doing. But somehow, they seem to always just be, the token old person. Ok, I will admit that it’s true, that the body begins to break down as you grow old! But, many older people are very active and can certainly keep up with the younger generation in many things. This band I saw was great to me! They are every bit as good as any high school or college marching band… yet they were …well… not young! If you read fantasy fiction, have you ever noticed that there are often wizards and such going along with the adventure of the younger folks, having to be every bit as vital and strong as the younger protagonists? But why are they so rarely “the star”? It upset me so much that some years ago I wrote my own trilogy (amateur) just to have most of the “stars” of the older generation! It felt good! Occasionally the movies get it right with pictures like, Cocoon, and Fried Green Tomatoes. There are a number of excellent movies like those.. but they aren’t the money makers that the studios want and so, once again, those movies are few and far between. This is one case where I believe the Brit’s are much smarter than the Americans. They have never been “obsessed” with the skinny, young, beauty.. they want a good actor and looks are secondary. (I’ve got to move to England! ) Of course they have their share of gorgeous actresses and actors, but it just doesn’t seem to be a “must” to be beautiful, nor a “must” to be young to be talented enough to keep on working in the industry. So… here I am on a soapbox! How did that happen? geez! I never thought I’d get off on that subject! So much for watching The Macy’s Parade! That,… or… it just made me feel good not to have the older generation shoved into oblivion. I was taken by surprise to see this trailer for Tale of Despereaux! I didn’t even know they were making a movie from this book! Then I saw a trailer of this cute little mouse with oversized ears and grinned from ear to ear… take a look, maybe you will too! The grim specter of sickness looms over the Weyrs of Pern, felling fire-lizards and posing a potentially devastating threat to their dragon cousins, Pern’s sole defense against the deadly phenomenon that is Thread. Fiona, the youngest and only surviving daughter of Lord Bemin, is just coming of age, and about to assume the duties of a Weyrwoman, when word spreads that dragons have indeed begun succumbing to the new contagion. With the next season of Threadfall quickly approaching, and the already diminished ranks of the dragons once more under siege, every Weyr across Pern is in crisis mode. It is hardly the time for disturbing distractions–such as the strange voice Fiona suddenly hears in her mind at the darkest and most urgent moments. Circumstances and the mood of the weyrfolk worsen when advance patrols relay the dreaded news that black dust–the unmistakable herald of falling Thread–has been sighted. As more dragons sicken and die, leaving only a new generation of weyrlings too young to succeed them, Weyrleader B’Nik and queen rider Lorana arrive from Benden Weyr to comb Fort Weyr’s archives in a desperate search for clues from the past that may hold the solution to the plague. But could the actual past itself prove the pathway to salvation for Pern’s stricken dragons and the entire imperiled planet? Guided by a mysterious ally from a wholly unexpected place, and trusting in the unique dragon gift for transcending time, Fiona will join a risky expedition with far-reaching consequences for both Pern’s future and her personal destiny. Ok.. it’s official I just finished reading my 22nd Pern novel. Never in my life would I have thought that I would read 22 books about the people and dragons of a planet named Pern! This book, written by Todd McCaffrey, isn’t a slam-dunk, as many of his mothers books were to me. Let me say this about myself first: I am not a picky person (at least I don’t think so). This goes for both, movies and books I might add. In movies, I don’t notice the mistakes made that some people seem to find. (“did you see the shadow of the camera in that shot? ?”) They seem to pass me by as I am much to interested in the story and what’s going on. That being said, I shocked myself when I couldn’t get past some things that Mr. McCaffrey did in this book. The first few books he wrote about Pern, the people there, and of course the dragons, he wrote in collaboration with his mother, who is the person who first brought Pern and the dragons to life. Then he did write one alone. I guess my biggest problem (if it is one) with the books written by both mother and son, was simply getting used to the fact that it was a different TIME in Pern that they wrote about and NEW Characters. (loving the original characters as I do this was no simple thing to get over, but I figured if Todd kept writing about the “same new characters” that eventually I accept them and all would be well in Pern once again. As a good point for this book, I will say that Todd had some good characters, that I quickly began to like and was interested in what they did and said. The seeming “star” of the book, Fiona, who became Talenth’s rider was shaping up nicely. So was Xhinna, her female friend. Cisca and K’lior, the Weyrleaders, I would like to have known better, but they were also good, as was T’Mar, Zirenth’s rider. But some non-consistencies just jumped out at me….. One in particular was, Tajen (T’jen)who’s dragon went between due to an illness. In other books if a dragonrider lived when his dragon died he was depressed a long time, did not want to try to impress another dragon and overall never got over the loss. In this book T’jen looses his dragon and not long after is happily helping others. This compared to Lytol, in The White Dragon, who lost his dragon and had to leave the weyr because he could no longer be around dragons, and who then for many years became a drunk, before finding a reason to live again. (Raising Jaxom) That was a huge thing to me to not keep consistent with other happenings. This story wraps around the fact that the dragons were dieing of an illness. As I read of the deaths I couldn’t help but notice that they talked of the losses as if it didn’t bother them: “I think we are going to lose Yerinth and Casunth today.” This sort of thing was written over and over. The sadness and the lose of both dragons and their riders just wasn’t there. 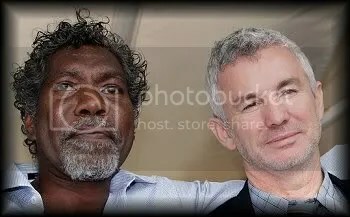 Instead what was talked about was how few they had left to fight thread. It may well be just me, but I just felt that there was something missing. Like a story was being told without sympathy. Something else I couldn’t grasp was that Fiona and her queen Talenth go back in time with a mysterious weyrwoman. It is never really explained who she is or where she came from. (ok, so this might be saved for the next book).. however, once they went back in time there was no more mention of Cisca and the time they were in or the sick dragons. You’d think a small chapter would have been written about how they wonder where they disappeared to? But, nope. Nothing. This is so unusual for me to find so many small things that bothered me, yet I kept on reading. 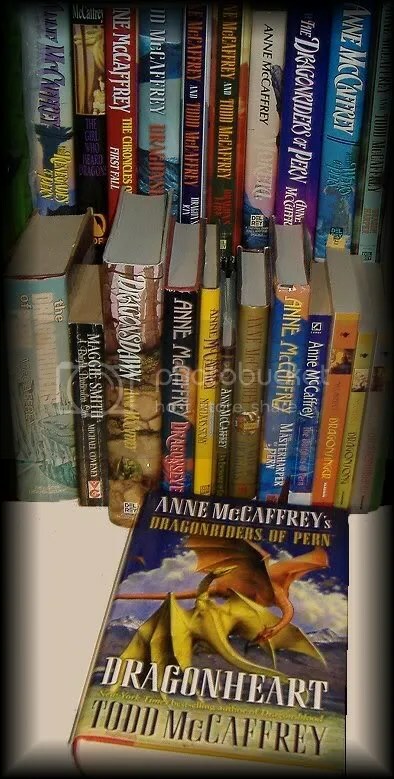 Behind it all there is a decent Pern story with some new and interesting characters… I’m certainly not one who wants only Anne to write about Pern, after all, she can’t go on forever. So I DO want her son to be able to take over and continue more stories. So far, he’s not the writer his mother is. But I’ve given him a chance with the books he wrote WITH his mother, and I’ve read his other book he wrote alone called Dragonsblood… and undoubtedly I will give him yet another chance in hopes that I will find out about all the loose ends he’s left dangling! But beyond the faults, I did still have to say that (for the most part) I enjoyed the book. Like I said there are some good characters and I hope he answers the million questions he left hanging… so yeah, I’m waiting on the next book once again! 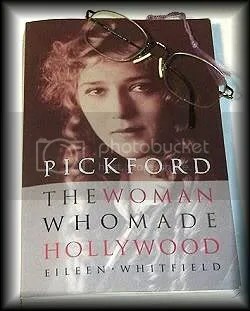 As has happened to be on other occasions.. after having just read two books about Mary Russell and her husband Sherlock Holmes, what should come on Turner Classic Movies but two old, black and white, Holmes movies! Holmes was smuggling a man from Switzerland, who invented a bomb-site, into England to make them for the war. 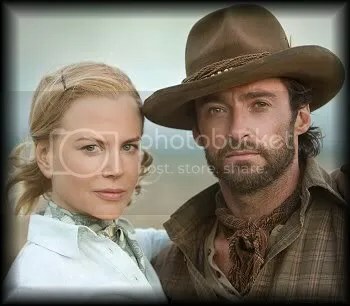 But what got to me about this movie was the hairdo that they had given Holmes! For some reason I think I have a memory of it, but I’m not sure! One side of his hair was brushed forward and the other had a curl onto his forehead. It was so unusual that I couldn’t stop watching his hair during the whole movie! 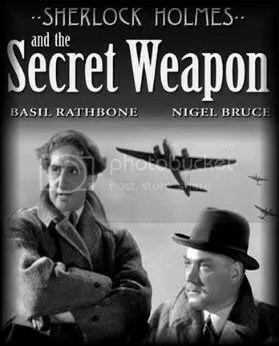 I think my enjoyment of the old Basil Rathbone Holmes movies though was how entertaining Nigel Bruce was as Watson. When the movie concluded it asked that you go and buy War Bonds!! For this movie Basil had a normal hairdo, and I was glad of that! 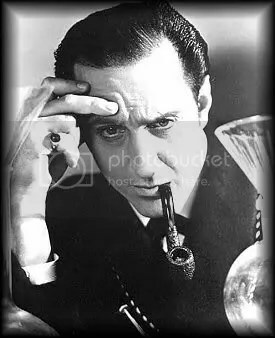 I know there have been many other actors who have portrayed Sherlock over the years, but I believe Basil Rathbone will always remain the definitive Holmes to me. 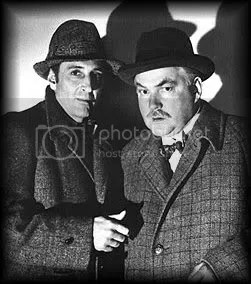 Many only know Nigel Bruce as “Watson”, but over his career Nigel acted in 78 movies and most were not Holmes movies! 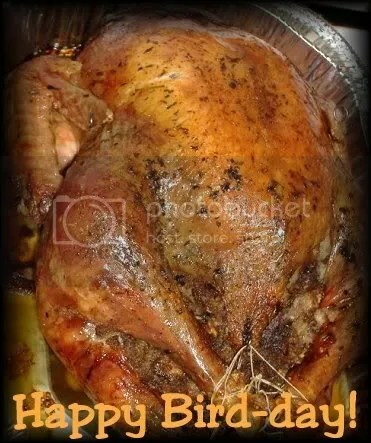 Here’s a bigger surprise… he was born in Baja California! Rathbone made 119 movies, and was born in Johannesburg South Africa.